San Francisco is known for many things and ice cream is definitely one of them. One of the most popular ice cream destinations is Bi-Rite Creamery. Part of the Bi-Rite family, the Bi-Rite Market opened in 1940 and eventually opened their own creamery in 2006. They serve homemade organic ice cream and also have a soft serve window. We went on a warm day in February and the line was about 20 mins long wrapping around the street corner. Go with cool friends, it makes the line go faster. They not only make the ice cream in house, they also have a bakery attached and make all brownies, marshmallows, toffee in the ice cream. They also make toppings such as peanut brittle and hot fudge. 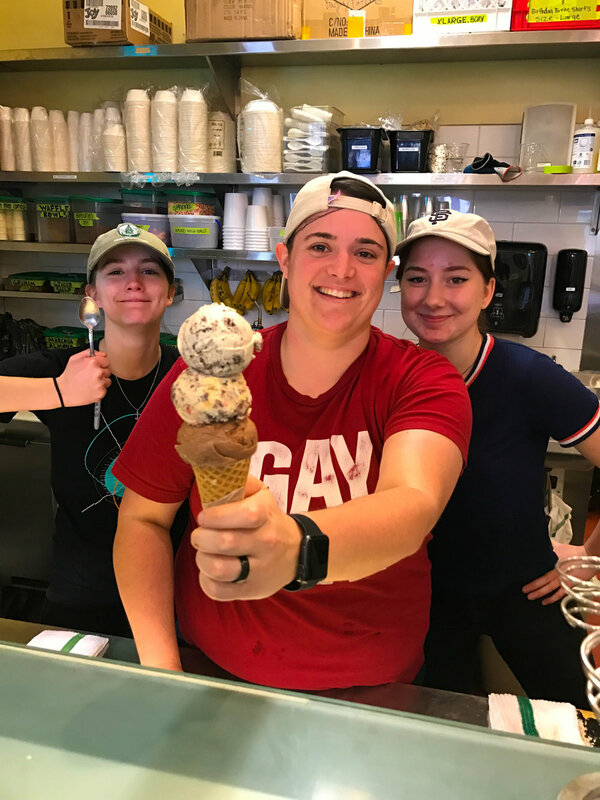 If you're lactose intolerant, don't worry, you can join in on the fun too, they offer a vegan, dairy-free ice cream daily! SO MANY OPTIONS! Happiness is definitely one scoop at a time. I took my delicious coffee toffee, Cookies & Cream, chocolate cone and decided to eat it in the park across the street. I texture had the perfect balance of creamy and soft. My favorite was the cookies and cream. I tried the rose, salted caramel, and a peanut butter fudge type. Since it was so warm, my friends and I walked across the street and decided to enjoy our ice cream, and the views, from Dolores Park. We were definitely a fan of Bi-Rite and will come back next time we are in SF!